From prototyping to volume manufacturing, prostheses to implants, 3-D printing is opening up a new world for medical device designers. 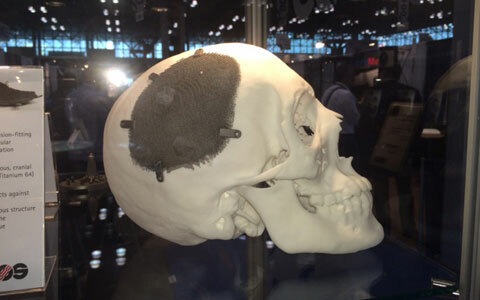 Exhibitors at MD&M East and Atlantic Design & Manufacturing showed off some exciting medical applications for 3-D printing. 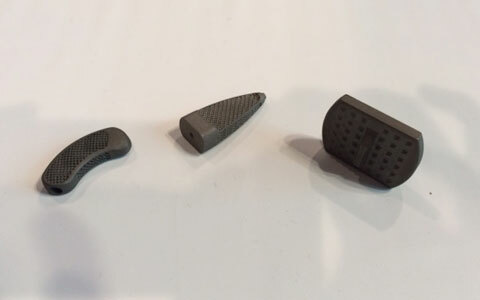 At last week's MD&M East and Atlantic Design & Manufacturing shows in New York City, a number of medical applications of 3-D printing were on display. Formlabs, maker of the Form1+ desktop 3-D printer, showed off an early iteration of the Sutrue wound-closure device. This prototype was printed via stereolithography using an acrylic plastic similar to PMMA. The entire assembly process took just over 22 hours, and material cost added up to less than $12. Airwolf 3D, which makes desktop fused deposition modeling systems for prototyping and direct digital manufacturing, had a cast made from standard ABS material and finished with an acetone vapor treatment. Because it was made from 3-D scans of a person’s arm, its more ergonomic and holds the bone in the correct ingposition better than traditional casts. It can also be cleaned easily with soap and water or even thrown in the dishwasher. Cimquest, a distributor of Stratasys 3-D printers, presented an example of how 3-D printing can be used for preoperative planning. A model of a conjoined twins’ skull was made with an ABS material on an FDM machine. The design was created from CT scan data, and the model was used by surgeons who performed the twins’ separation surgery. 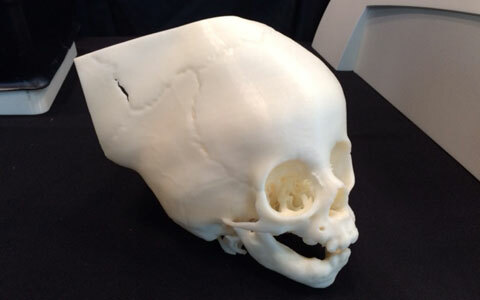 EOS, a provider of additive manufacturing solutions, exhibited a custom-made cranial implant. Made via direct metal laser sintering using the EOSINT M 280 system and EOS Titanium 64 material, the implant protects against heat, is permeable for liquids, and features a lattice structure that supports the attachment and in-growth of bone tissue. 3-D printing is often used for prototyping and small-run manufacturing, but 3D Systems, a maker of 3-D printers, proved the technology can also be used for volume manufacturing with spinal implants. Made via direct metal printing using Ti6Al4V, the two implants on the left feature a porous zone that allows two adjacent vertebra to grow together—a characteristic that must be added as a coating on traditionally manufactured orthopedic implants. Stratasys had on hand an extreme prosthetic leg made for a snowcross and motocross star who lost his leg in a racing accident. 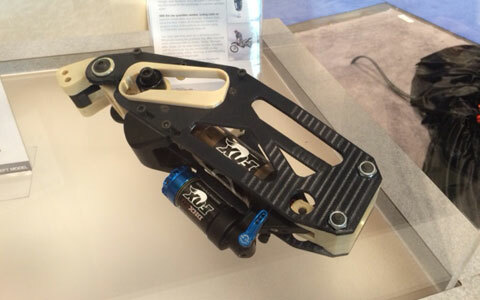 The device combined parts made on the Fortus 3D Production system using Ultem 9085 with a Fox shock and has allowed Schultz to get back to activities such as snowmobile racing, horseback riding, skiing, cycling, and wakeboarding. Learn more about 3-D printing medical devices at the MEDevice San Deigo conference, September 1–2, 2015. Jamie Hartford is editor-in-chief of MD+DI. Reach her at [email protected].